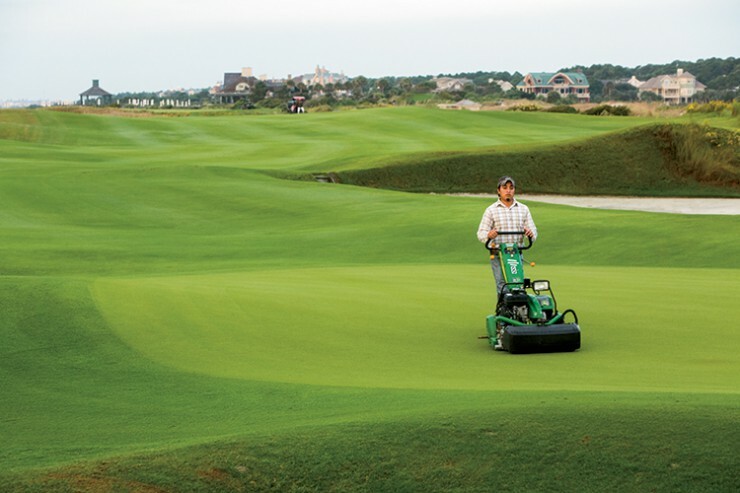 South Carolina’s green industry, from the landscaping in a homeowner’s yard to the world-champion golf courses at Kiawah Island Resort, is flourishing. Cash receipts for the greenhouse, floriculture and nursery business remain consistently high, the industry’s job sector is strong and recovery from the recession continues on track. The green industry, which includes horticulture, floriculture, nursery and turfgrass, is South Carolina’s third-leading agriculture sector. According to the state’s Department of Agriculture, the industry’s cash receipts total more than $300 million annually and account for more than 15 percent of all cash receipts in South Carolina. 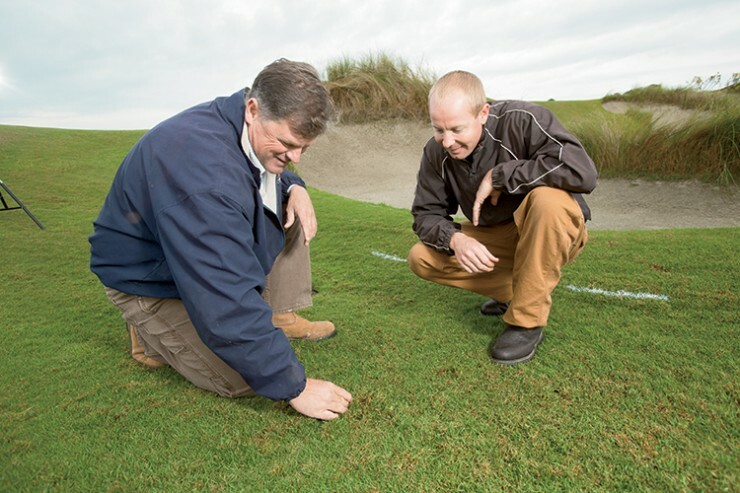 Course superintendent and turfgrass expert Jeff Stone and his assistant Lee Painter check turf around the traps at Kiawah Island’s Ocean Course prior to late season pre-emergent application. The turfgrass segment of the green industry is particularly strong in South Carolina and Jeff Stone certainly knows turfgrass. 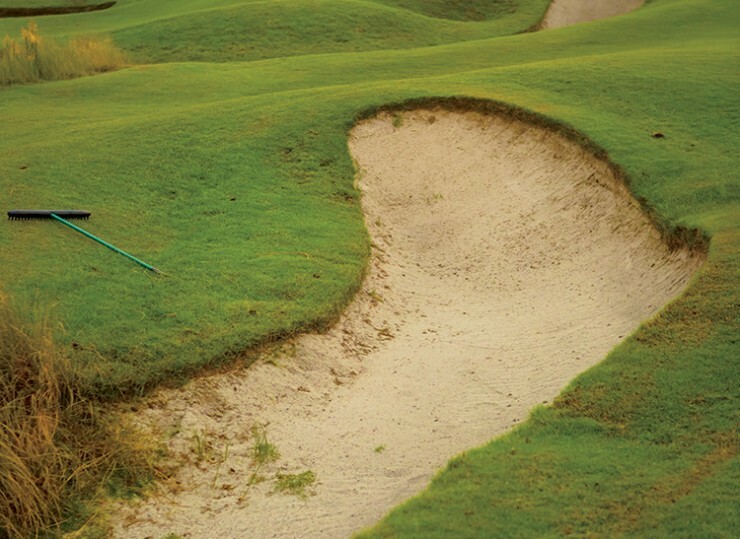 He is golf course superintendent for the Ocean Course, one of five golf courses at Kiawah Island Resort near Charleston. Ocean Course hosted the 2012 U.S. Open and the 2007 Senior PGA Championship. One stand-out aspect of the course is the Sea Isle Supreme paspalum grass that was installed in 2003. This grass is not only functional, it has a historical connection to South Carolina. 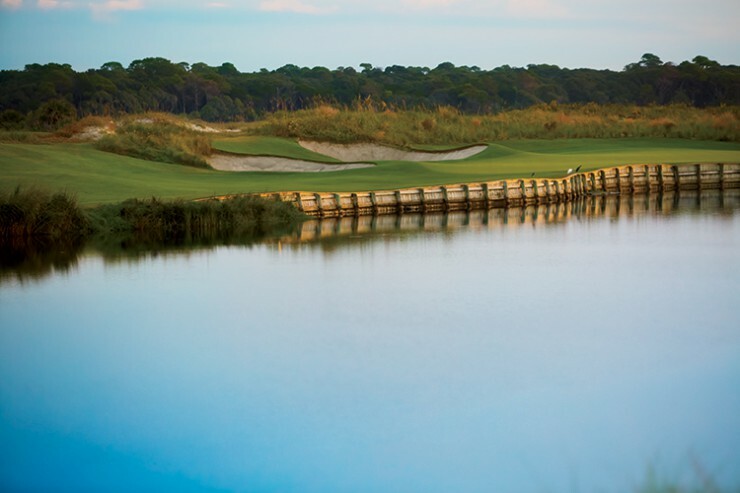 Renowned course designer Pat Dye proposed using the strain of paspalum discovered on Sullivan’s Island, and Stone says it’s proven to have been the right choice. With a sod farm in Rembert and a retail outlet in Columbia, Modern Turf is a prime example of a turfgrass business that has grown considerably in recent years. Kerfoot is a former golf course superintendent, as are others on his staff, and he believes that job makes for the ideal turfgrass representative. The Ocean Course is mowed and groomed. The grass, a sturdy and beautiful paspalum native to the state, is now used on premier golf courses along the eastern coast. The SCNLA was created in 1958 as a way to promote the state’s nursery industry, provide education opportunities and engage with the general public. The association sponsors two certification tests, hosts an annual trade show with more than 380 booths and around 25 speakers, and publishes a bi-monthly magazine featuring industry-related articles and member features. “About a third of our members are growers, a third are landscapers, and a third are retailers and others such as irrigation people or fertilizer and chemical companies,” Foster says. For those interested in pursuing a career in the green industry, South Carolina has a number of opportunities. Clemson University is a leader with its environmental horticulture program, through which students learn about plant physiology, genetics, plant breeding, pest management, fruit and vegetable crops, arboriculture, floriculture and turfgrass management. The state also has a number of technical or two-year colleges that include programs for the green industry.